My Car Isn’t New… but it IS Clutter-Free! I’ve never had a super fancy car… but I’ve always had a clutter-free car! When I got my first car (’94 Grand Am), I can remember spending SO much time cleaning it and making sure every compartment was neatly organized. Ten years later (and a slightly newer car), I still love cleaning and organizing my car! While the exterior might not always be clean, you’ll almost never catch me with a dirty, messy, or cluttered interior. I like to keep my trunk almost empty — just in case I find a great sale and need to cart something home. 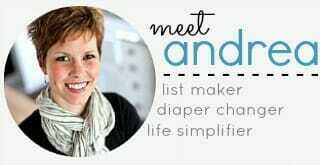 I keep jumper cables and a couple blankets in the spare tire compartment, and my reusable shopping bags and a few baby necessities on the “deck”. 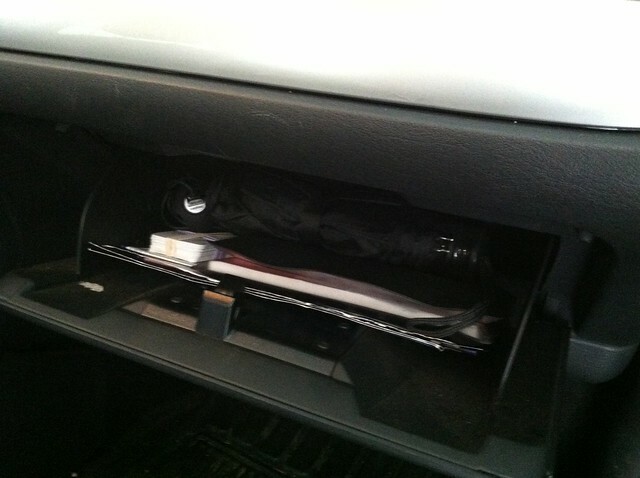 If any area in my car has the potencial to get a bit cluttered, the glove box would be it. I usually keep it under control, but for some reason, I often find miscellaneous junk shoved in there every time I clean! 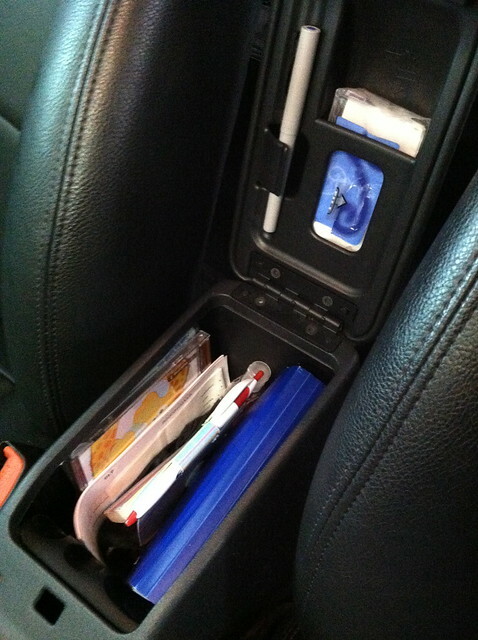 I keep my car documents and insurance information in the glove box, as well as extra business cards, an umbrella, cleaning wipes, a car charger for my phone, and restaurant coupons (since I’m usually sitting in the passenger seat when we go out to eat). I love the middle console in my car because it’s not so big that I can shove tons of stuff inside, but it’s big enough to fit some basic “essentials”. I keep a pack of tissues, pen, paper, sunglasses, my coupon organizer, and several blank deposit slips for our different bank accounts. We only have one pocket on the back of the passenger seat and we use that to store our Atlas — yes we still have an Atlas, and we often prefer it over GPS for longer road trips. 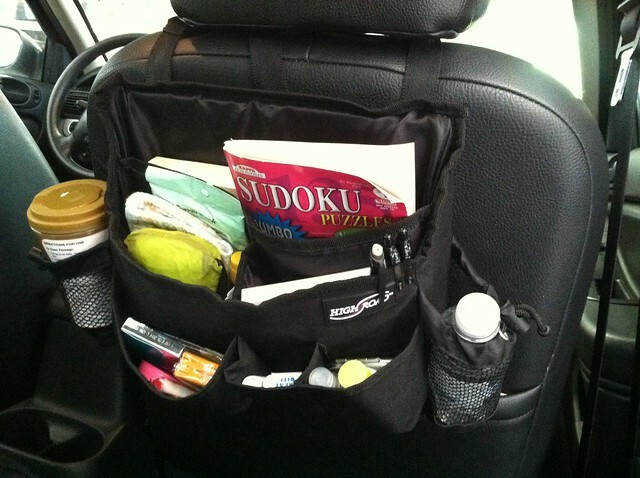 However, I also use this “Swing Away Car Organizer” from Clever Container to store and organize a few other items that have been handy to keep in the car (especially now that we have a baby). We keep a travel size container of baby wipes, an extra burp cloth, extra pipe, bottle of water, hand sanitizer, gum, mints, lip gloss, lotion, paper, pens, a few snack items, and some activity books all neatly organized on the back of the passenger seat. And since it’s called the Swing Away, it easily swings around to the front if I need something while I’m driving. That’s it — that is all the “stuff” I have in my car (well, besides Nora’s car seat). I’m usually extremely diligent about cleaning out my car after every use. I don’t leave trash or papers in the car, I don’t let stuff pile up in the truck, and I even try to regularly vacuum out the crumbs! Just like any organizing project, it takes a bit of will power and continual maintenance to keep our car clutter-free, but the one thing I almost always do is keep a small basket or reusable shopping bag in the passenger seat while I’m out and about. That way, if I stop at the post office, pick up a prescription, get a smoothie from McDonald’s :), grab the mail on my way up the driveway, or accumulate anything else that doesn’t belong in my car, I can put it in this basket/bag and promptly remove it from my car when I get home. And no, I don’t just let it sit on my counter to collet dust! I trash, recycle, file, or put away everything in the bag/basket and then put it back in my car the next time I run errands. While my car stays neat on a daily basis, I don’t take the time to vacuum or deep clean it nearly as often as I should… especially in the cold winter months. I TRY to stop by a local $3.00 car wash every month or so. When I’m there, I take advantage of their free vacuums to clean out the inside, and while I’m riding through the car wash, I use my car cleaning wipes (in the glove box) to wipe down the dash board, leather seats, middle counsel, etc. When I can’t get to the car wash, I use our shop vac to vacuum out the interior and usually just skip washing the exterior — unless it’s a really nice day! 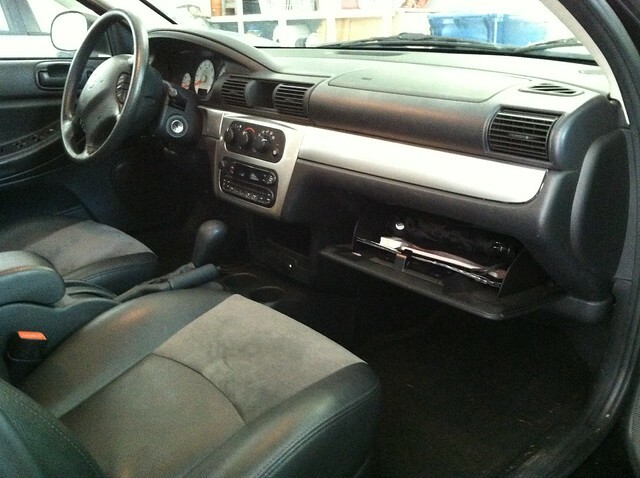 I don’t know about you, but I LOVE driving around in a clean and organized car — especially after it’s freshly vacuumed. And since it only takes me a few seconds to declutter each time I drive somewhere, I definitely think the results are worth my effort! 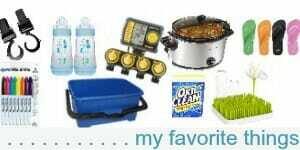 Do you keep your car clutter-free? I know you’re a firm buyer for purchasing items on Craigslist, but was wondering what your thoughts are on Ebay? 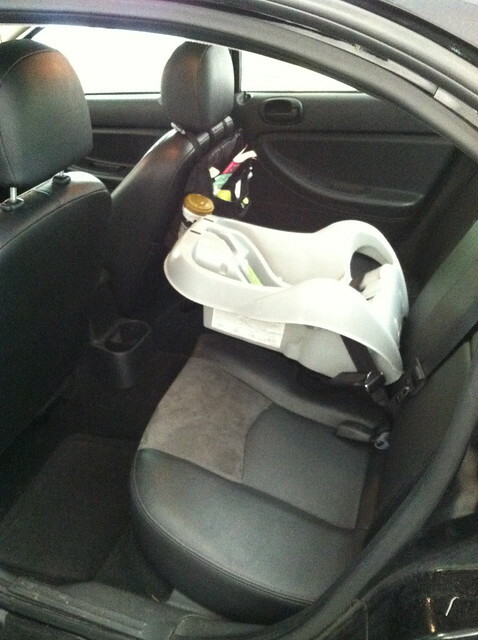 I’ve been researching convertible car seats and just read about what you all use. Yes downfall on Ebay is not getting to examine what you’re about to purchase and just hope it comes to you in shipment as is. Just wanted to know what your thoughts were on the subject. yes, we LOVE Craigslist over here! I’ve honestly not done a ton with Ebay — but millions of people buy and sell on Ebay all the time so I can’t imagine it’s a bad deal 🙂 I know they offer “buyer protection” for some things so you could always look into that. Other than that, I’d just say to read the seller’s reviews. If they have a bunch of positive reviews, you’re probably safe — but again, that’s just my opinion, not my personal experience. no food in the car (except water) and when we get home, everything that was collected during any car trip gets taken inside to trash or back where it came from, nothing stays in the car(except maybe coats, we live in the rainy northwest) besides pine needles nothing clutters the car/van! Wow! I’m especially impressed that you can keep your car that way given that you have a little one! I’ve worked as a professional clutter clearing organizer for over 13 years and having children often transforms formerly clean and organized cars into nightmares. I think your commitment to MAINTAINING a clean and organized car makes all the difference. You don’t take your car for granted! You tend to its condition every time you get in and out of it! Kudos to you! And, thanks for the recommendation of the product by Clever Container! Please come to my house NOW and organize my van. Good golly! I need help! This article has inspired me. Maybe I will send you BEFORE and AFTER photos… maybe not. Keeping my minivan is easier now that my kids are older. They don’t bring little toys or snacks in the car. The worst thing is that the carpet is still sticky from when I bought my son a fountain drink which spilled when I turned a corner. He was probably 7 at the time and is now 15. How sad is that? But where do you go to get the carpet cleaned? Organizing with Clever Container must be in the air! Luv…luv….having a paid for and clutter free car. I was vacuuming the trunk this week. My car is a DISASTER!!!! Well actually it much better than usual because last weekend I couldn’t take it anymore. I cleaned it out. This is such a struggle for me. 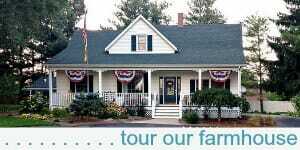 I have an hour commute, and a 15 minute trip to “town” any time I need anything. I tend to have stuff in my passenger seat and trunk ALL THE TIME. Since I spend so much time in the care I have a lot more “essentials” than you. lol My two and four year old seem to travel with a ton of toys, hats, stuffed animals and blankets. Any tips for those of us who have more stuff to keep with us? Ideas on corralling kid clutter? The swing around thing would be great except my kids are constantly emptying pockets and KICKING the back of the seats. Setting limits might be much more helpful then a bunch of organizing products. Come up with car rules and stick to them. For instance, one item per child and if it’s not brought back into the house upon return, that privilege will be taken away on the next car ride. If that’s too hard, one small bag of things for each child where the expectaion and natural consequence still apply. My twins were able to understand this starting at age 2. Modeling these habits is also a big help. I LOVE your use of teh swing away! Wait till your child is older !! My car is full of stuff: buckets and spades, crab lines, a kite, boules set, packed bag of clean clothes plus suntan lotion and beach shoes. I also have a first aid kit, wellys and coats. My car is on red alert for a beach day when the kids have finished school – yippee. I am obsessive about my car being clean and clutter free. Like you I make sure everything gets cleared out after each use. My trunk even looks like yours less the baby items. In addition to my reusable grocery bags I have an organizer that folds flat when not in use. It has an insulated compartment that can hold up to 2 gals of milk. I love it mostly because it keeps my milk jugs from tipping over when I go around the corner. It is really nice for road trips too for keeping us organized. My husband uses our car most of the time (we are sharing one car right now to save $ because he’s in law school), but when we get a chance, I love to clean it out. Cleaning it out makes me feel like it’s a little newer – it’s the same feeling I get when I re-organize drawers or closets – it’s almost the same as going shopping, usually takes less time, and definitely takes a lot less money :). It is a 20 year-old 2-door sedan that has 3 carseats in the back – yes, three – but like others have said, it is completely paid for, reliable, and has A/C, so it’s just what we need right now. I was mentioning to my 4 year-old at the zoo the other day that one day we would get a van, but we had to save up, and he replied, “But Mommy, we don’t need a van right now – we just need our car.” And he was right :). We have four kids ages 2-11yrs and one of “Mom’s Rules” is that everyone has to take everything and anything that belongs to them (toys, garbage, used wipes, books), out of the vehicle EVERY time we come home. Even if someone has to run to the bathroom, they head straight back out to the vehicle to get their “stuff” 🙂 Every two weeks or so, my husband vacuums the inside and washes the outside, and this is working for us – my husband and I love having a neat and tidy vehicle – it seems calming somehow. This has become such a habit for us that we were on vacation last year and a friend commented that our vehicle looked so clean (this was after driving for 10 hours with four kids) lol! Mom of 4 here also…totally agree! My car is usually mostly clutter-free. Both my kids are always wanting to take something with them everywhere we go (I’m pretty sure they are going to be stars of an episode of hoarders one day) and somehow those little trinkets and toys always end up in the back seat of my car. But I try about once a week to have them take everything inside and put it away. This past weekend my husband completely cleaned out my car so we could take pictures and post them to sell the car. It hasn’t looked that good since the day we bought it! So now I feel like the crazy mom telling the kids to keep the car clean! I have to ask, why do you have an “extra pipe” in your car? What kind of pipe? Maybe it’s a regional thing, but I have no idea what a baby pipe is. LOL Is it what you call a pacifier? I don’t think it’s regional. I live in Michigan too and have never hear “pipe”. Hmm. Maybe that’s what brand new moms are calling them. arrrrhhhhh lovely mess free, crumb free back seat, very envious! Not that you need any more advice but I’ve added a basic first aid kit to my car essentials. I can’t tell you how many times its has saved the day from the kids booboos to this Mama’s random headaches. I’ve never needed much more than bandaids and pain relief but after a crazy park incident that took us to the ER we now have first aid kits on both cars cause you never know. Good idea Sarah. Nora isn’t very “mobile” yet, but this is still probably something we should have handy! I love driving a clean and clutter-free car too! Just seems to make the coming and going smoother. And I know this will sound crazy but I just feel like my van drives/runs so much better right after a good cleaning…LOL! Okay, my husband would love for me to keep a car this clean! I have a pretty bag that I keep between the front seat with all our “essentials,” yet it still is always a mess. I may have to look into an organizer like you have – that looks so much better! You’ve inspired me – off to clean the car! Thank you for this post! Your car looks wonderful – mine is a disaster. I’ll be taking care of mine over the next few days. My daughter got into my car last night and told me my car looks worse than hers! Not only is my car clutter-free but it is a 4-door, reliable, paid-for car! I recently became debt-free and will remain that way! Sunday night my 7 year old & I washed the car and it became a bug-free, 4-door, reliable, paid-for car! At least until I drove him to school Monday morning! I love having my car clutter-free. I don’t allow my daughter (who’s almost nine) to eat in the car unless we’re on a long trip, and my son is less than a year old, so keeping crumbs and stuff out is not a problem at all. I also try not to keep anything in the car that isn’t necessary, though right now the back of my Jeep Grand Cherokee is full of stuff to take to Once Upon a Child to sell. But like you, we have umbrellas, tissues, some change, the important vehicle papers, a spare diaper bag with just the essentials, and a garbage bag. It’s so nice to have the car nice and tidy.